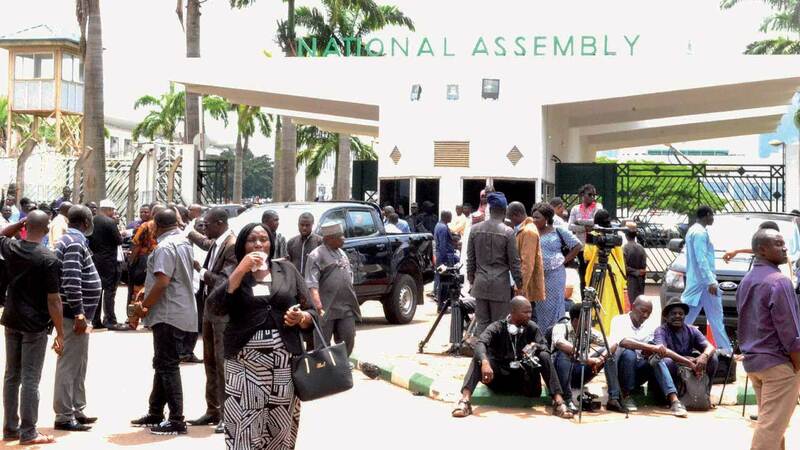 Some National Assembly staff and journalists who were barred from entering complex due to a blockade of the main gate by officers of the Department of State Services (DSS) in Abuja…. A fomer governor of Kaduna State and human rights activist, Col. Abubakar Umar (rtd), has asked the federal government to thoroughly investigate the role of former director general of the Directorate of State Service (DSS), Lawal Daura, in the invasion and blockade of the premises of the National Assembly by operatives of the Service last Tuesday. Umar, who condemned the siege by armed, masked personnel of the DSS, said there were many undemocratic measures by Daura that had hitherto undermined democratic principles of government, which the federal government must make the former DSS boss to account for. According to Umar: “Without a doubt, the summary dismissal, last week, of Daura, came as a big surprise to many people; it seemed to contradict the world order.“In the last three years, Daura had marched from one audacious act of impunity to another; had rudely defied the President; had routinely ignored court orders and seemed all but successful in curving out, for himself, a government within a government in Nigeria. “There was hardly any observer of the turbulent Nigerian political scene over the last several years who still believed that Daura was subject to any laws, not to speak of official code of behaviour. “But on Thursday, August 7, Acting President, Prof Yemi Osinbajo, signed a terse, two-paragraph letter, telling Daura that he has been dismissed from office. Insisting on thorough investigation of Daura and those behind the alleged threat to the nation’s democracy, Umar argued: “In the interest of our democracy, in order to guard against unexpected threats and conspiracies, the action taken by the acting President must not stop halfway. “The government should seek to discover the motives, as well as the explanation for some of those crazy maneuvers, many of which simply beggars belief.”Some of the questions Umar said are begging for answers include: “Where and in what condition are all the assets handed over to Daura by the immediate past director general of DSS, Mr. Ita Ekpenyong? “What are the reasons why Daura deployed DSS operatives and prevented EFCC The Economic and Financial Crimes Commission) personnel from searching the residences of Ekpenyong and former director general of the National Intelligence Agency (NIA), Ambassador Ayo Oke?